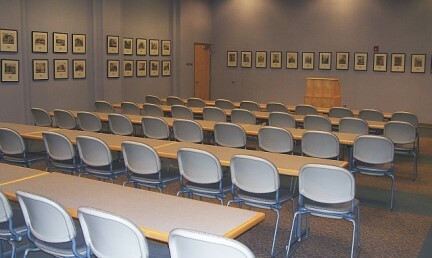 The library offers two meeting rooms for use by organizations for civic, cultural, and educational purposes. The Wiley Conference Room can accommodate 31 (with tables and chairs) or up to 60 (without furniture). 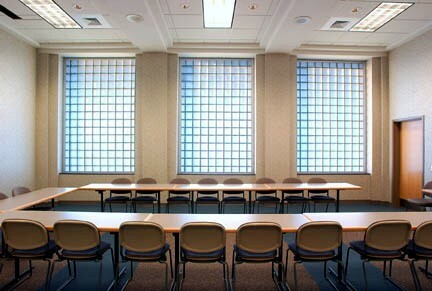 The Warner Meeting Room can accommodate up to 86 (with tables and chairs), 110 (chairs only), or up to 185 (without furniture). A variety of audio-visual equipment and Internet connectivity are available. There is no charge for use by local non-profits and government agencies. A fee of $50 per 3 hours per room is charged for other groups.Reservations are required. To apply for a room reservation online please visit http://braswell-library.libcal.com/booking/meetings or telephone the Customer Service desk (252-442-1951, option 2). The library offers three Study Rooms for use by 1 to 4 people. Food is not allowed in the Study Rooms but drinks are. The rooms are equipped with a table and chairs. There is no charge for use of these rooms but commercial use is not allowed. If a reserved room is not claimed within 15 minutes of the reserved time the reservation will be canceled and the room may be offered to someone else. Users are limited to 2 hours per day except for exams proctored by library staff and Twin Counties Literacy Council Tutors. The library offers a computer lab for use by organizations for civic, cultural, and educational purposes. Social events are not allowed. Food and drink are not allowed in the computer lab. The lab is equipped with 20 laptops, with mice, for attendee use. A variety of audio-visual equipment and Internet connectivity are available. There is no charge for use by non-profits and government agencies. A fee of $50 per three hour block per room is charged for other groups. The Computer Lab must be reserved at least a week in advance of your use. To apply for a reservation visit http://braswell-library.libcal.com/booking/pclab or phone 252-442-1951 extension 851.